A serial entrepreneur, Abhay Jain is CEO & co-founder of ActiveScaler, which provides Real-time API and application development platform for Connected car and empowering In-Motion intelligence. ActiveScaler’s In-Motion solution is designed to transform every industries which can utilize real-time data from connected vehicles. 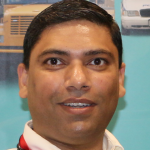 Over the last decade and half, Abhay has founded Jinvani Systech, a SD card testing tool and embedded software stacks for consumer applications. He was co-founder of ZeoTech software, a B2B software portal for property agents in India. His diverse enterprise IT experience includes working with VeriFone, AgreeYa Solutions, Dualcore, ARC and Newgen software.